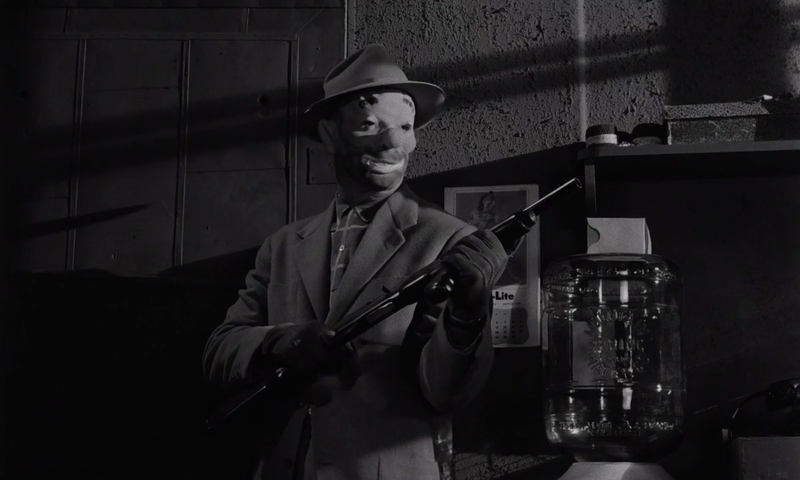 Before Stanley Kubrick became Stanley Kubrick, he made a pair of low-budget crime dramas in the mid-50’s that are standouts in the film noir canon. 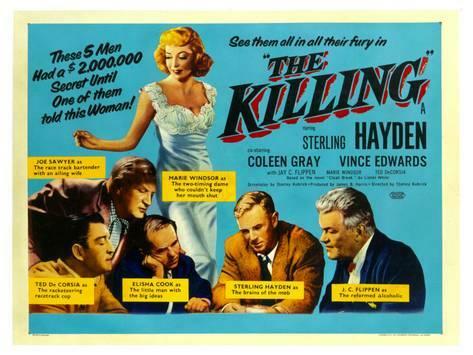 The second of these, THE KILLING, is a perfect movie in every way imaginable, showing flashes of the director’s genius behind the camera, featuring just about the toughest cast you’re likely to find in a film noir, and the toughest dialog as well, courtesy of hard-boiled author Jim Thompson. THE KILLING is done semi-documentary style (with narration by Art Gilmore), and follows the planning, execution, and aftermath of a two million dollar racetrack heist. 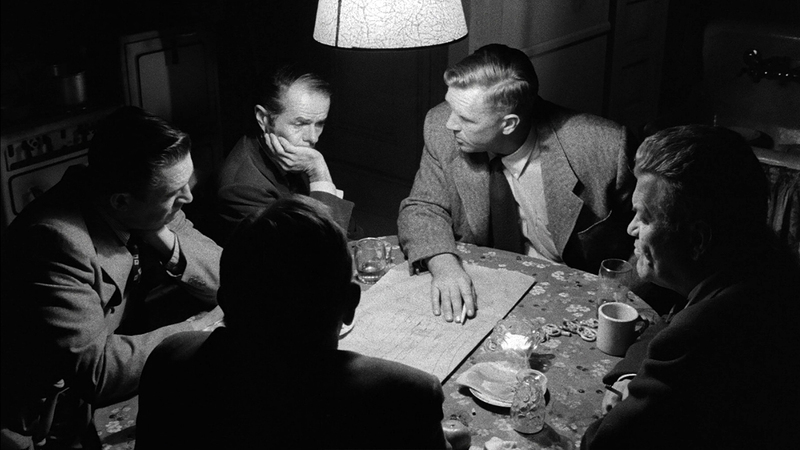 Sterling Hayden plays the mastermind behind the bold robbery, a career criminal looking for one last score. 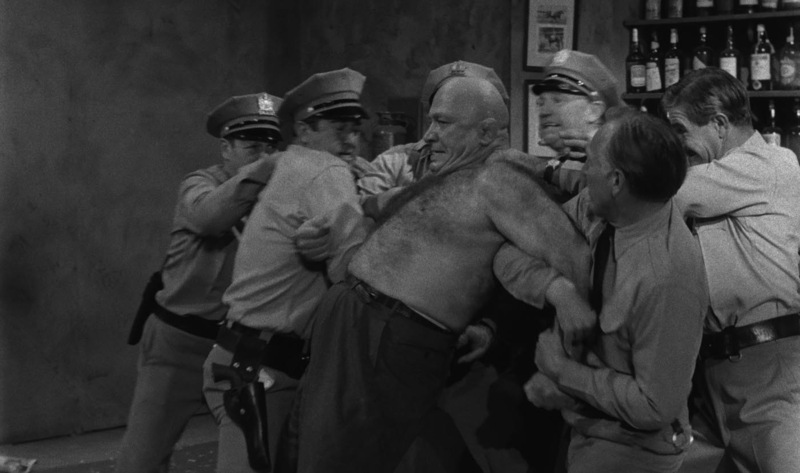 He’s aided and abetted by a moneyman (Jay C. Flippen ), a track bartender (Joe Sawyer ), a teller (Elisha Cook Jr. ), and a crooked cop (Ted de Corsia ). He also hires a sharpshooter (Timothy Carey ) and a chess playing wrestler (Kola Kwariani) to create diversions in order to insure the heist’s success. And indeed the robbery does go off without a hitch… but there’s a proverbial fly in the ointment. Seems timid Cook has a bitchy wife (Marie Windsor ) who constantly berates him for being such a loser, so he spills the beans to her about his upcoming good fortune. She in turn gives the info to her young stud lover (Vince Edwards ), who gets ideas of his own. 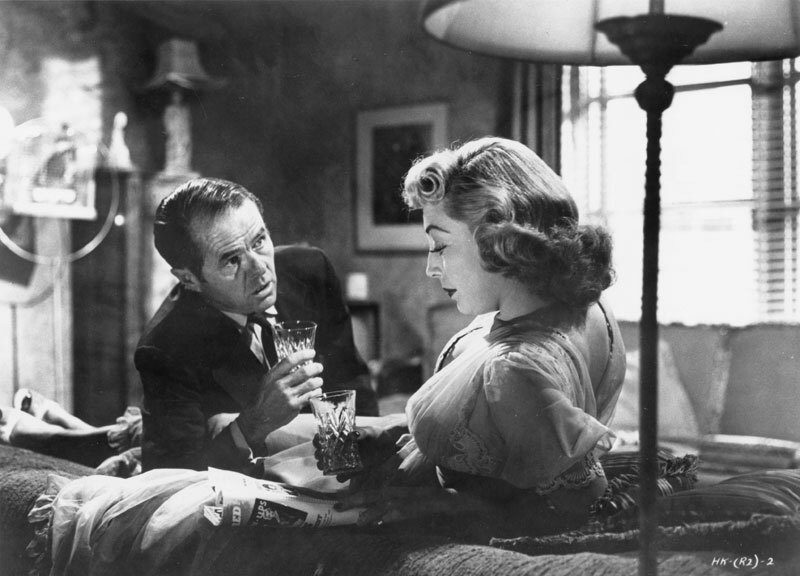 I won’t say anymore for those of you who haven’t seen this marvelously malevolent movie, among the finest films noir you’ll ever see, with an unforgettable final line delivered to perfection by Hayden. Kubrick’s photographic eye captures every detail, from the mundane day-to-day lives of these people to the audacity of the crime itself. He sometimes repeats scenes to show them from different character perspectives, giving them added depth. Kubrick began as a photographer for LOOK Magazine, and then got into films directing several documentary shorts. 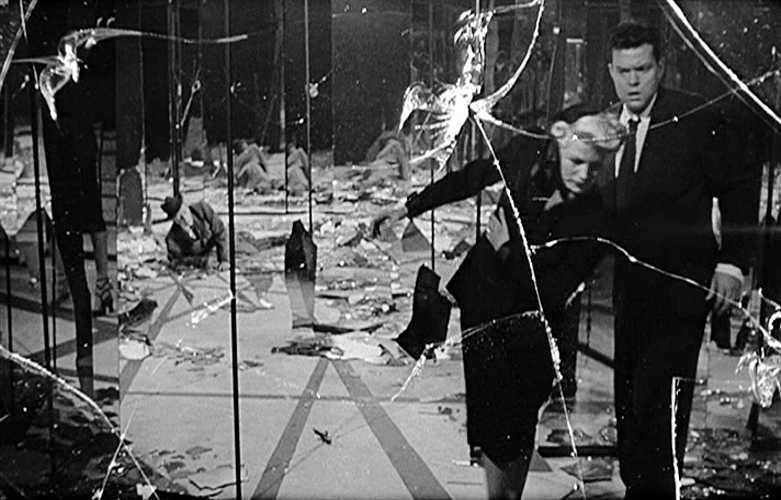 He wanted to be his own cinematographer for this film, but the union wouldn’t have it, and the veteran Lucian Ballard was hired, but make no mistake, every shot in THE KILLING is pure, unadulterated Kubrick! 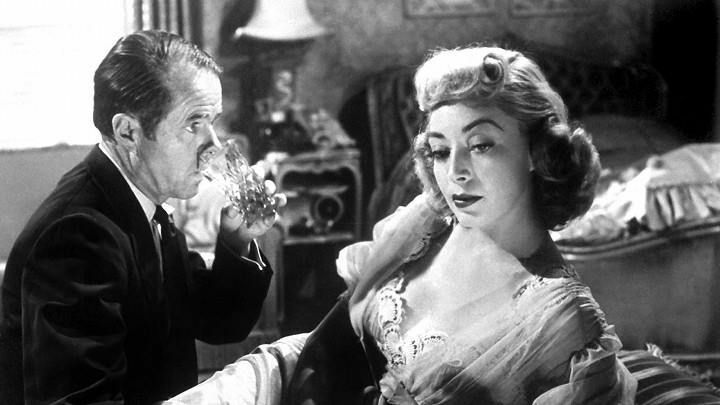 The cast is perfect, but Elisha Cook and Marie Windsor absolutely steal the show as the weak, mousey husband and his unfaithful wife. Cook, unquestionably the Crown Prince of Film Noir, adds to his Rogue’s Gallery of weaselly types as a schlemiel who only wants to please his rotten wife. And Windsor is rotten indeed, the ultimate Queen of Mean, a beautiful package on the outside that masks an ugly black soul. Their scenes together are sheer dynamite, and Kubrick allows both actors to shine. The oddball Timothy Carey gives yet another oddball performance here, but it’s brief and it works. Kubrick’s chess playing friend from New York Kola Kwarianai, a real-life professional wrestler and promoter, plays the goon hired to create a distraction. Under Kubrick’s watchful eye, Kwarianai does well with his dialog, and excels in the wrestling-inspired scene at the track. There’s so much going on in THE KILLING at all times (something that definitely caught my eye: a poster for a Burlesque show MC’d by Lenny Bruce) it takes more than one viewing to take it all in. And I’m OK with that; THE KILLING is worth watching over and over again. Excellent review! It’s indeed a masterpiece, perhaps my all-time favorite “heist movie”! Killer’s Kiss is pretty good too. BTW, Elisha Cook and Marie Windsor kinda reprised their roles for the TV mini-series Salem’s Lot (1979)? It’s one of the show’s many in-jokes. Have you seen it? Yes, many moons ago! I didn’t get the connection at the time… guess I’ll have to watch it again! This looks great! Right up my alley. Where can you find it? I caught it on TCM a while back, but I’m pretty sure it’s available on DVD or some streaming services, Meg. Well worth seeking out! Thanks, I’ll have to look for it! I just watched this last night. Terrific movie! Rented it on Itunes. I’m going to watch it again today. The Killing is a personal favorite of mine. Nice review, Gary.